Did you know that as you read this page, there are recruitment businesses growing their brand presence on social media? Some are striking up relationships with potential future clients. Some are growing a highly targeted audience of candidates in their sector. They are quite possibly developing a recruiting brand whose strength is staggering in relation to the size of their business. Worryingly they may well be building up a lead that it will be very costly for other recruitment businesses to claw back at a later date. 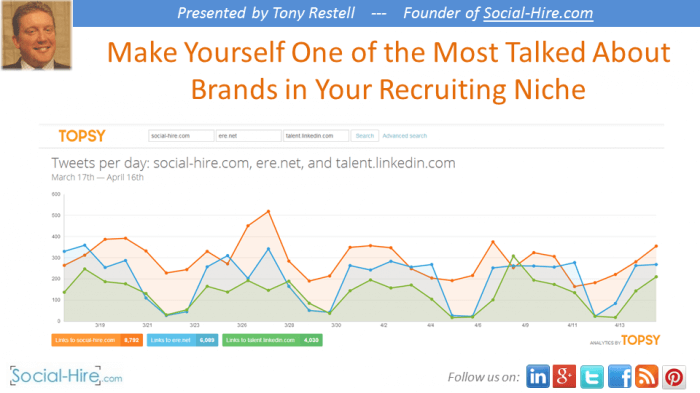 That’s why I wanted to host a presentation all about leveraging social media to become the most talked about recruiting brand in your niche, so our recruiter contacts are better placed to act quickly. A strong social media presence can attract a steady flow of targeted candidates to your business. It can spark conversations with potential clients and elevate you to a position of authority in the niche recruiting markets you serve. But you have to have the right social media strategy in place; and you have to know how to deliver on that strategy. Hopefully the video recording below will help enormously. But if you'd like to accelerate things further, you are very welcome to schedule a call with the Social-Hire team to talk through your business and the steps it could be taking. Just book in a convenient time here. The slides are also available below, though I recommend the video recording above as lots of the worked examples, screenshares, etc. that I ran recruiters through you'll obviously only see by watching the recording.